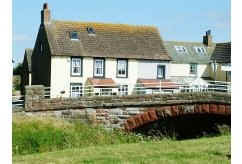 This five bedroom coastal cottage is situated in Allonby in Cumbria. Allonby, which is know as 'Cumbria's hidden gem' is a small quaker village with 5 miles of safe sandy beach on the Solway Coast. This area is famous for its magnificent sunsets and is an ideal holiday destination as it is only 30 minutes from the Northern lakes and mountains of the Lake District. The cottage dates from the 18th century and features 5 bedrooms including 4 double bedrooms and one twin bedded room. The dining room has seating for 10. The well equipped kitchen includes a hob, grill and oven, fridge, freezer, microwave coffeemaker, with a washing machine and tumble dryer in a separate utility room. The lounge has a television, video, CD player, radio and audio tape player. There are 2 bathrooms, one with electric shower over the bath and one with a shower attachment. The cottage has a small garden at the front with a private walled yard at the rear. Within 20 metres of the cottage there is a village green and grassy area which follows the coastline, a totally enclosed childrens play area with fun apparatus and child friendly surfaces. Within a 10 minute walk of the house there is an indoor swimming pool, sauna and solarium. This lovely village boasts a restaurant, two pubs (both serving food), a cafe and two shops. There is also parking available and there is a possibility to hire bicycles. This property provides an excellent base for sports enthusiasts as nearby possibilities include: golf, sailing, waterskiing, diving, mountaineering, surfing, windsurfing, fishing, paragliding, swimming and horse riding. Bridge House has central heating and linen and towels are provided at no extra cost. There are also 2 cots available if required. Children and pets welcome. Sorry no smokers. 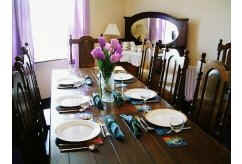 Please enquire for prices for 4, 3 or 2 nights. find here cheap hotels near Macau airport - We thank you that you choose to spend your holiday together with us using our website for guiding you in this wonderful town. find here cheap hotels close to bilbao airport - We thank you that you choose to spend your holiday together with us using our website for guiding you in this wonderful town. Hospitality starts at Birmingham broad street Hotels - The website Birmingham Hotels Broad Street contains information about what you need to know about what involves a holiday near Birmingham Broad Street. preferred hotels at south beach miami - Hotels in South Beach Miami is a website which informs you about all the aspects that concern a holiday in South Beach Miami. accommodation close to naples on the beach - Naples Hotels on the Beach are gladly welcoming you to our locations and are pleased to be your host. find hotels at airport - Downtown Philadelphia Hotels is excited to welcome you to the amazing city center of Philadelphia, Pennsylvania. accommodation in bucharest - Bucharest apartments for rent. Daily Accommodation has apartments located in the very heart of the city - close to famous restaurants, clubs and pubs, and the largest shopping district in Bucharest, Romania. try this site for cheap hotels Liverpool albert dock - We are here to guarantee you that you will have a wonderful trip! need hotel with parking at Berlin Mitte? - Hotels in Berlin Mitte are wishing you a great stay at our hotels!